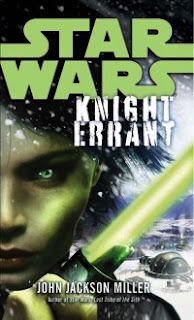 A few weeks have passed since the release of the Star Wars: Knight Errant novel, and I am pleased to publish the production notes for the novel. Read up on the making of the story, including the challenges of getting into the head of a character that doesn't want to let anyone near. Dig ye the novel's odd and arduous connections to everything from Barbarians at the Gate to I, Claudius — plus the origin of Kerra's name! This is a first pass; there are trivial bits I'm sure I'll remember later on as I'm asked abou t them. You can find the notes here. I plan to answer the questions for the Ask-Me-Anything in a series of posts here over the next few days (I still have to get the notes for #5 online, too) — but as promised, I did the drawing for the signed copies of both the novel and Aflame #1-5. The winners are Robert "Bob" Messing and Loren Bickford! As I'm familiar with both your names from TFN and Facebook, I'll message you directly for mailing information. So keep checking back for those answers — I'd have had them today, but the notes page was pretty sizable. Meanwhile, there are not one, but two podcasts out tonight in which I discuss various things including Star Wars. First on Star Wars Action News, we get into Star Wars collecting; then on the Functional Nerds podcast, we really range all over, getting into comics history and my own useless super-power, being able to recite all the cover-price changes in comics history. And also Knight Errant and Lost Tribe, of course. I love these notes you do Mr. Miller! They are always so informative!